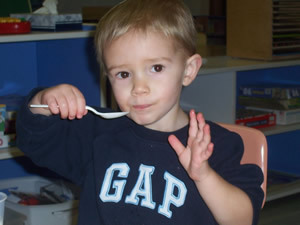 The Children's Center prides itself in serving delicious and nutritious meals to our children! Breakfast, lunch and snack are provided according to the United States Department of Agriculture guidelines. Our meals are served family style and provide an opportunity for teachers to stress the importance of nutrition, food safety, manners and more! Infants are also a part of this food program. The Center provides any locally available Iron Fortified Infant Formula the family chooses. As children grow, baby food, milk and solid food will be provided according to the USDA food program guidelines.